YouthPolitics UK is an organisation established last year (run by the youth, for the youth) to target political apathy among young people. This year is the centenary of the first women in Britain gaining the right to vote, and so 50:50 Parliament joined forces with YouthPolitics UK and the People’s History Museum, on the banks of Manchester’s River Irwell, to host an evening of discussion around women’s experience in politics today. Jess Molyneux is Head of Training at YouthPolitics and responsible for providing free training to give young people the skills they need to enhance their democratic voices. Jess is also 50:50’s Manchester Ambassador. The collaboration with the national museum of democracy was especially exciting, as the museum’s emphasis on engagement and representation is so important to 50:50 and YouthPolitics alike. The evening kicked off with a panel discussion chaired by Jess. 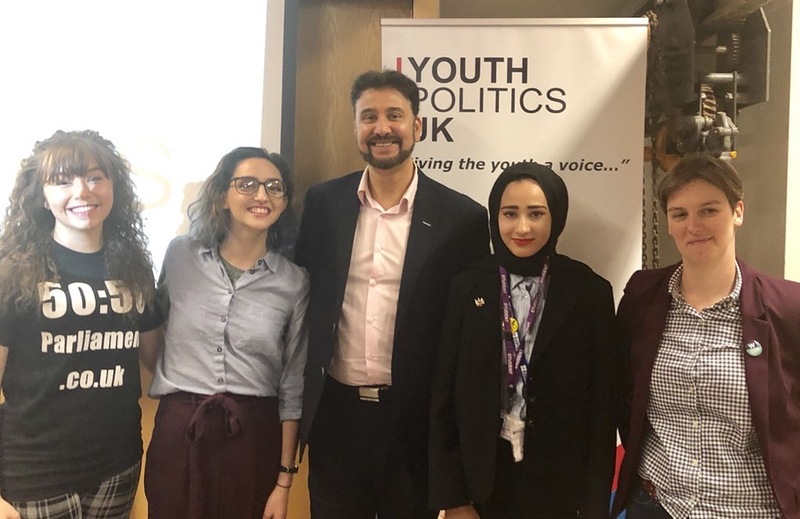 A lively debate ensued with Baronness Beverely Hughes (Deputy Mayor of Greater Manchester), Afzhal Khan (MP for Manchester Gorton), Jessica O’Kelly (member of the Women’s Equality Party), Sam Audini (President and Women’s Officer of Durham University’s LGBT+ Association), and Sumayah Saadi (Parliamentary Ambassador for British Youth Council). They discussed the culture of politics which puts up barriers for women and why representation is so important. All the panelists wanted to see more women in positions of power, and had an informative debate about how we achieve equal representation. Questions from the audience were followed by a workshop activity on the motion ‘This House would introduce quotas for women in Parliament’, in which audience members discussed the benefits and drawbacks of positive discrimination. Many of the young people in the audience expressed an interest in joining 50:50 Parliament and supporting the #AskHerToStand campaign. This was a great way of establishing a 50:50 presence in Manchester, and we hope it will be the first of many such events.